You may have heard in a previous post that the huz’s burger was selected as a finalist in a burger creation contest at a favorite local bar & grill – Sidetrack! 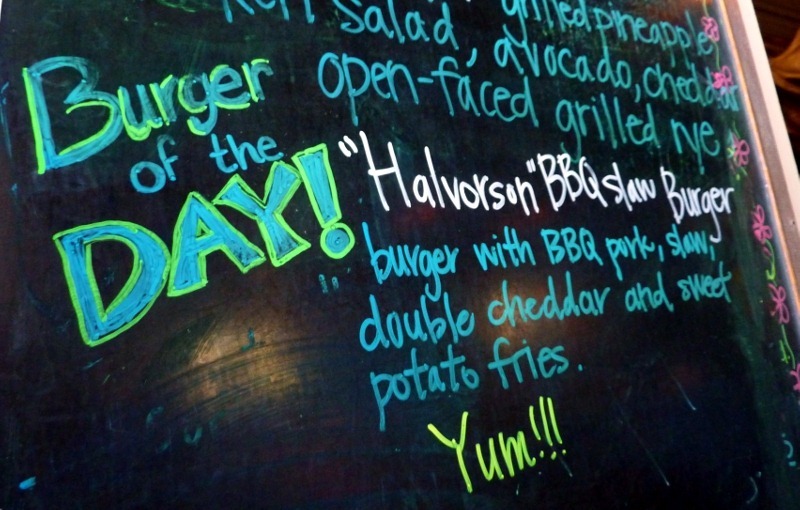 And this picture, taken by yours truly, was posted on Sidetrack’s Facebook wall yesterday, advertising the burger! Yup, that’s the huz. 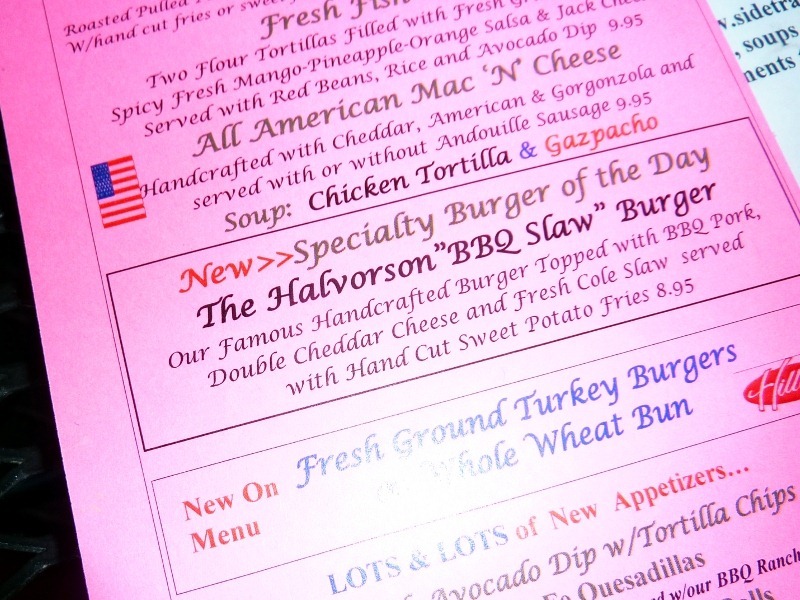 Once our beers were ordered, we noticed The Halvorson BBQ Slaw Burger listed on the menu! Five Cent Femme joined us on our excursion, and, being the bold individual she is, asked the diners at the table beside us what they had ordered, to which they replied, “The specialty burger! The “Halvorson”!”, which was followed by squeals elicited by Five Cent Femme and myself as we proceeded to point out Mr. H himself, the creator. (Can you say run-on sentence?) Muahaha! Our server also happened to stop by at that moment, and told us that the burger had been a popular item all day! We were treated very well by the Sidetrack staff (as always). Oh me, oh my, this was rather incredible. I devoured every last bite of this, as did most everyone else at our table, of their respective burgers. We are really excited to have the huz’s burger in the Final 4 and would totally appreciate if you could help us vote. 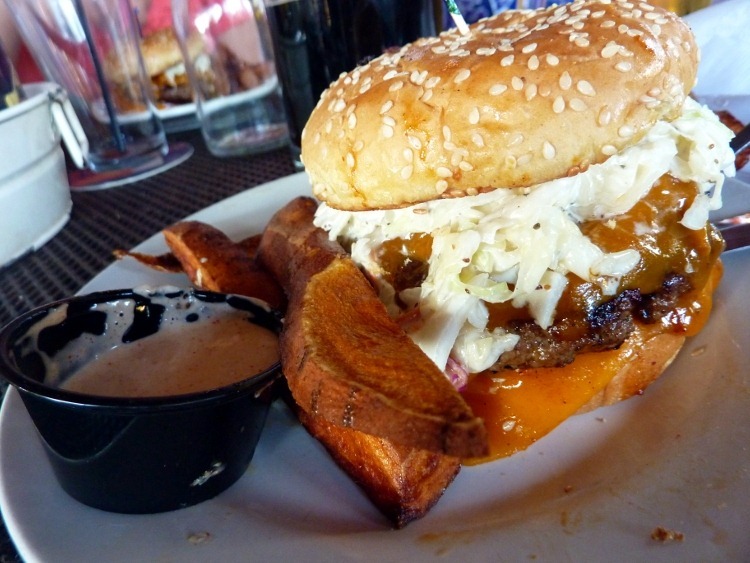 The winner’s burger not only will become a fixture on the Sidetrack menu (so cool!! ), but also, the winner will receive free burgers for one year! Your votes are highly appreciated. 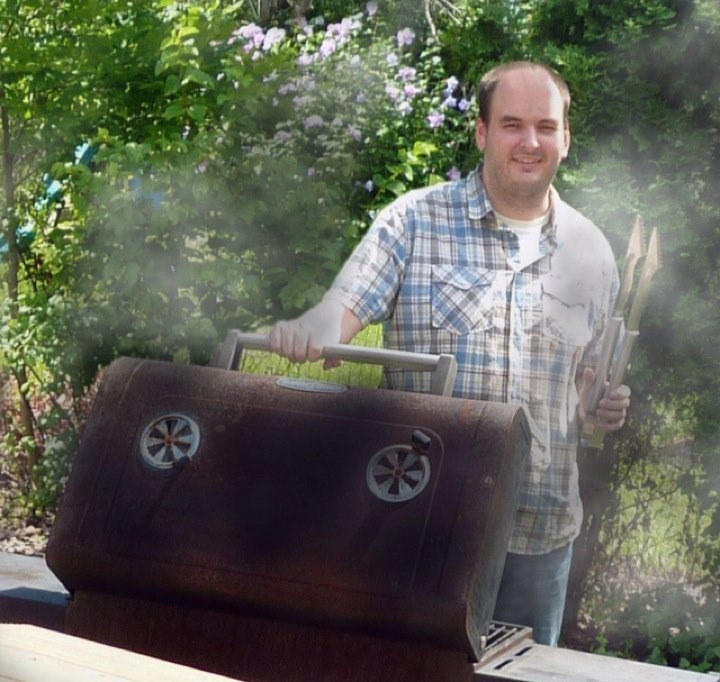 The poll is open to burger lovers across the country, not just locals! Currently listening to: In For The Kill (Skream Remix) – La Roux. Pingback: Proscuitto-Wrapped Sea Scallops « Meg.Goes.Nom.Nom. Pingback: Burgers, Wraps, and Sandwiches « Meg.Goes.Nom.Nom. Pingback: Sidetrack Chicken Pot Pie « Meg.Goes.Nom.Nom. Pingback: Jamaican Jerk Pit, Take II « Meg.Goes.Nom.Nom. Pingback: Baby You Can Have Whatever You Like « Meg.Goes.Nom.Nom. Pingback: A Tried and True Weekend « Meg.Goes.Nom.Nom. Pingback: A Little Love For Ypsi and The D « Meg.Goes.Nom.Nom.